This winter I proposed a PhD research project to Dr Joseph Tzanopoulos at the Durrell Institute of Conservation and Ecology, University of Kent. I studied my undergraduate degree here, in the beautiful city of Canterbury, in the beautiful Kentish countryside, I set up TreKent Rambling Society, expedition’ed to the Amazon, and made some life-long conservation friends. Anyway, enough reminiscing. He liked the research proposal, which of course involved the Dhofar Mountains of Oman. More specifically I proposed a continuation of my Masters Degree research project – but with the study area expanded throughout Jabal Qamar and Qara, more refined design and even more cross-disciplinary methods. After some exciting Skype conversations with Joseph and being accepted for PhD study at Kent, I put together applications for funding from the Kent 50th Anniversary Scholarship and the South East DTC Scholarships. I now await a response from both these scholarships with bated breath. So what exactly have I proposed and why? Well I have written about conservation issues in Dhofar before but here is a refresher. Despite 40 years of rapid modernisation across Oman, pastoralism has remained deeply embedded in the culture of rural communities in the southern Dhofar Mountains (El-Mahi, 2011). Improvements in infrastructure and veterinary care have fuelled a growth in livestock numbers which now significantly exceeds the carrying capacity of the environment (Rouchiche et al., 2003). As a result widespread overgrazing is degrading key ecosystem services which support pastoral livelihoods. Jabal Qamar, Jabal Qara and Jabal Samhan comprise the Dhofar Mountain ranges. In the west, Jabal Qamar and Jabal Qara (approx. 4,375 square km) are most influenced by the monsoon between July and September. Here, the Dhofarian cloud forest (a hotspot for endemism) is threatened by overgrazing due to inhibition of a critical process known as horizontal precipitation capture. Removal of the tree canopies stops the ecosystem capturing crucial water from monsoon fog and evidence suggests severely overgrazed areas are unlikely to ever recover (Hildebrandt and Eltahir, 2006). The impacts of overgrazing are also undermining biodiversity conservation efforts. Most notably concerning the critically endangered Arabian Leopard, a flagship species for conservation in Oman, already facing threats associated with human-wildlife conflict due to livestock depredation. 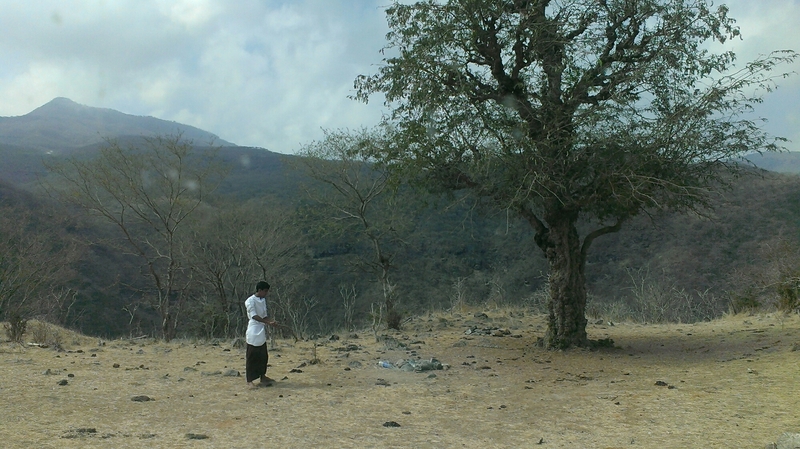 An intervention is urgently required to manage pastoral activity in Dhofar with greater consideration for its environmental impacts (Ghazanfar, 1998; Peacock and Ferguson, 2003; Tardelli and Raffaelli, 2006). However, previous research in the region has failed to bridge disciplines to unravel the dynamics behind overgrazing or harness the local knowledge (LK) of the pastoralists themselves. Local knowledge can fill in the gaps or supplement scientific data gathering with information that may have otherwise been missed due to the inherently complex social systems that interact with common-pool resource use (De Freitas and Tagliani, 2008). There is some background to why this research is needed, so what is my research? This project aims to provide an interdisciplinary understanding of the dynamics of overgrazing in the monsoon-influenced Jabal Qamar and Jabal Qara mountain ranges of Dhofar the results of which would help to support future policy decisions. Identify the spatial and temporal arrangement of grazing activity and what determines this. Methodology: Community-based participatory appraisal methods will be carried out with pastoralist informants. Local officials will be notified of the arrival of a visiting researcher and field rangers originally from the specific study area will accompany the researcher. This will help to secure initial interviews, after which snowball sampling will source further informants. This approach has previously proven successful. Participatory GIS (PGIS) methods using ArcGIS Collector application for Ipad will allow informants to map (directly onto high resolution satellite imagery) their grazing activity, and seasonal calendars and historical timelines will assist in the acquisition of temporal information. Factors that determine grazing activity will be included as GIS attribute information. Locations and details of livestock depredation events by wild predators will also be collected to analyse spatial and temporal trends in depredation events. Examine the social and ecological impacts of overgrazing. Methodology: Qualitative data on the social impacts of overgrazing will be acquired during semi-structured interviews with pastoralist informants using techniques such as problem ranking and brainstorming. The ecological impacts will be assessed through rigorous biological censuses sampling in a range of differentially grazed study areas determined by the results of objective 1. By doing so, the project will explicitly link measures of soil quality, primary productivity and biodiversity with grazing activity. There is the possibility of using camera traps supplied by the Oman OCE Leopard Project to survey for large mammals. Identify the drivers of overgrazing. Methodology: It is anticipated that there are significant socio-economic and political reasons for the persistence of pastoralism in Dhofar, resulting in overstocking and overgrazing. Semi-structured interviews with pastoralist informants will provide information on these drivers. Additional key informant interviews with community officials (Wāli’s), government officials and scientists, and dedicated literature reviews will obtain more authoritative information. By constructing a network of interacting drivers and using network analysis the critical paths that determine land-use systems and overgrazing will be identified. Evaluation of these pathways, their interacting dynamics and the observed state of the common-pool resource, against sustainability analysis frameworks (see Azar et al, 1996; Anderies et al, 2004 and Scoones, 1998), will determine the future trajectory of the socio-ecological system and its capacity for resilience, adaptability or transformability (Walker et al, 2005). Desk-based GIS analysis which incorporates both qualitative and quantitative data, remote sensing techniques and spatial analysis will produce insightful cartographic outputs. It will be possible to refine the display of the spatial grazing data by numerous classifications (e.g. by informant, livestock type, village, season, determining factors etc) and then overlay data such as greenness (NDVI), slope, hydrological flow, and biodiversity distributions. This will present an exciting opportunity to visually explore the socio-ecological relationship between pastoralism and the environment at localised and landscape scales. Habitat suitability modelling could be employed to identify potentially suitable pastures and livestock-predator coincidence. Finally, using accumulated evidence it will be possible to make recommendations for future policy that ensures pastoral activity in Dhofar is managed with greater consideration for its environmental impacts. More widely, this project should be of interest to agricultural and environmental researchers, policy makers and practitioners working in Oman and other regions of the Arabian Peninsula. Moreover, this project hopes to promote the application of community-based conservation approaches in Oman. So there it is (excluding some ethical, timetable, impact, motivation sections), let me know your thoughts? ← What is Participatory GIS (PGIS)? You might also consider using something like MAXENT to model how the vegetation zones might change under climate change. Will the suitable area for grazing shift or shrink (or grow) perhaps? Enjoy! Thanks mate – A field assistant invitation is there for you. I hope it all goes ahead so I can return the favour – sadly there wont be any massive lake networks to paddle.. I will look into MAXENT – at what sort of scale/resolution can you use it? A lot of these things tend to work better at larger scales and then once you get down to Dhofar Mountain scales they become less useful.